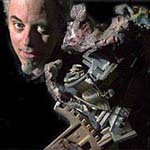 Frank Garvey has spent the last several years creating, composing for, and directing the world’s first robotic theater ensemble, the OmniCircus, in San Francisco. The OmniCircus features the experimental music group DeusMachina for which Garvey composes music, a ten-person resident troupe of actors and dancers, and the Robotic Ensemble of the OmniCircus, a unique group of twelve sophisticated electro-mechanical actors created by Garvey and long time OmniCircus collaborators Aaron Edsinger, Jeff Weber, Carl Pisaturo, and Eric Kenyon. Television broadcasts, Internet and print articles and reviews about Garvey’s work have appeared in numerous local, national, and international venues. At Carnegie Mellon University, Garvey has taught as an Adjunct Assistant Professor in Robotic Art was a research fellow at the Robotics Institute, and was a Microsoft Research fellow at the STUDIO. Garvey’s main research interest is the creation of performance works incorporating robotics and music-dance-theatrical ritual.